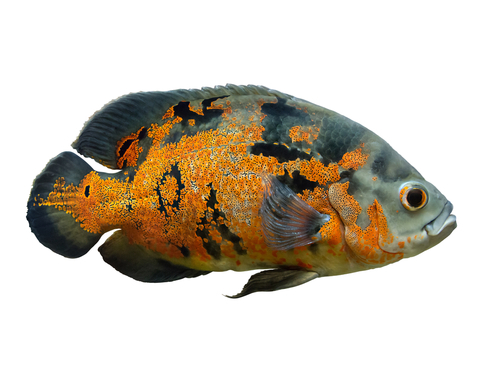 An oscar fish is known by a few different names, including tiger oscar, velvet cichlid and marble cichlid. Photo by Ekaterina V. Borisova/Shutterstock.com. Prosecutors have dropped misdemeanor animal cruelty and abandonment charges against a North Carolina man accused of abandoning his pet fish when he was evicted from his Wilmington home. Charges were dropped because fish aren’t protected under the state’s animal cruelty law, according to New Hanover County District Attorney Ben David. The Washington Post, the StarNews Online, the Port City Daily, the State and the Associated Press have coverage. Michael Ray Hinson, 53, was charged after deputies went to check on Hinson’s former home three days after his March 22 eviction. They found a sickly oscar fish living in a tank that was in “deplorable” condition, according to a spokesman for the New Hanover County Sheriff’s Office. But Hinson was charged under a statute that protects four classes of animal vertebrates: amphibians, reptiles, birds and mammals, excluding humans. Fish are not listed. David said in a statement he appreciates efforts by the animal services division to protect vulnerable animals. “We take a very dim view of anyone who would abuse any creature great or small,” he said. The fish was taken to an aquatic pet store called the Fish Room. It is being treated with medicine and a healthy diet, according to employee Ethan Lane, who spoke with the State. Lane said the fish was able to stay alive by eating cockroaches that fell in its tank. The fish was suffering from parasitic hole-in-the-head disease and had open sores and lesions on its head, he said.